Cornelia Lynde Meigs was the fifth daughter of six children. She attended Bryn Mawr College and after graduating in 1908, she taught English at St. Katharine’s School in Davenport, Iowa, until 1913. While in Davenport, she wrote her first book, The Kingdom of the Winding Road, a collection of fairy tales. She frequently submitted short stories and plays for publication and wrote many of her books under the pseudonym Adair Aldon. 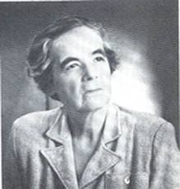 In 1932, Meigs joined the faculty of the English department at Bryn Mawr, teaching English composition and creative writing until 1950 and eventually rising to the rank of full professor. She also served as a civilian employee of the U.S. War Department from 1942 to 1945. Professor Meigs became an acknowledged authority on children’s literature, which was then becoming a new specialty. She wrote more than 40 books for young people, often with her students and nieces and nephews in mind. Her biography of Louisa May Alcott, Invincible Louisa: The Story of the Author of Little Women, received much critical acclaim. Prof. Meigs received numerous awards throughout her extensive writing career, including a Drama League prize in 1915 for her play The Steadfast Princess; three Newbery Honor Medals for her fiction; and the Newbery Medal for her Alcott biography. Cornelia Meigs is currently considered a "single author." If one or more works are by a distinct, homonymous authors, go ahead and split the author. Cornelia Meigs is composed of 8 names. You can examine and separate out names.